WideGap gasketed plate heat exchangers are designed for fibrous fluids and for fluids containing coarse particles. The wide gaps between plates allow fibers and particles to easily pass through the heat exchanger with minimum clogging. They can be configured with wide-wide or wide-narrow channels, which make the units ideal for heating, cooling and interchanging duties. The smooth port design ensures fibers don’t get stuck at the entrance. 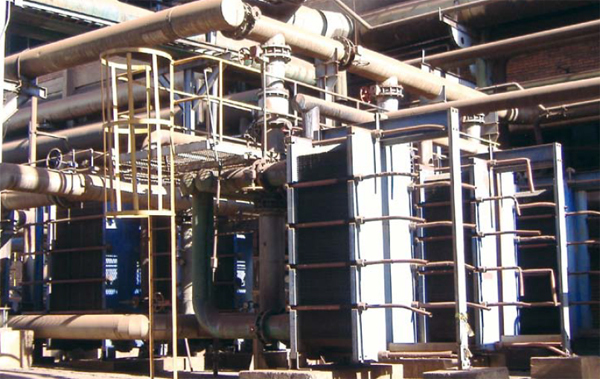 SantelisaVale replaced 15 inefficient shell-and-tube units with six Alfa Laval WideGap plate heat exchangers. The WideGaps recover heat from two process streams and use it to preheat mixed juice. The revamp led to a cut in live steam consumption by 40-50%. The excess steam is now used for electricity generation. High flow turbulence between plates results in higher heat transfer; however, the consequence is pressure drop. Our thermal design engineers can help you design and select the model and configuration that is suitable for your application needs while delivering maximum thermal performance and minimizing pressure drop. 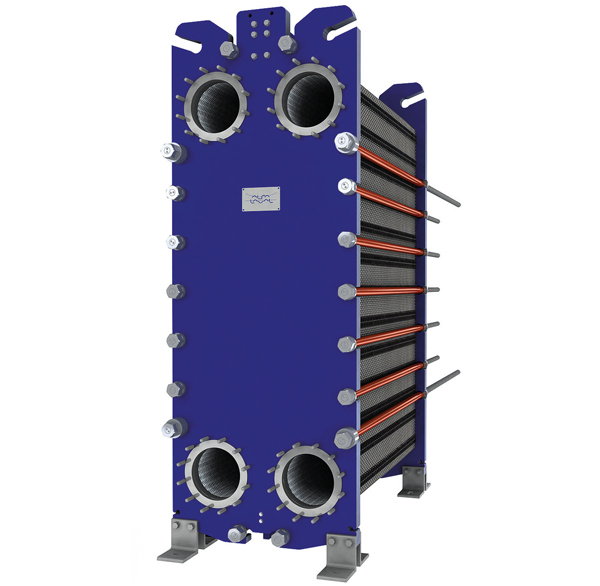 The WideGap heat exchanger can be configured in many ways. The channels can have either a wide/wide gap or a wide/narrow gap with different channel gaps. 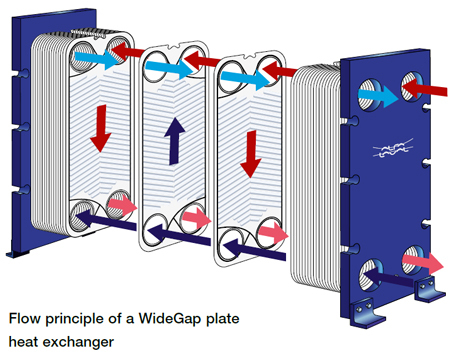 WideGap heat exchangers are usually configured as multi-pass in order to ensure enough turbulence. The pictures below show cross section views of the two different plate pack configurations. One extra wide channel for fibrous/dirty flued (A) and one channel for non-fibrous fluid (B). Two wide channels for fibrous/dirty fluids (C). Glue between the gasket and the metal plate safeguards high quality bonding for the toughest operating and service conditions. A two-component oven-cured epoxy glue, that can only be removed from the plates by special treatment, will keep the gasket on the plate during cleaning. Gaskets attached to a plate with rubber glue, oven-cured or not, does not achieve a strong enough bond, which can result in gaskets falling off during cleaning, when the temperature gets critical or when aggressive fluids make the gaskets swell. The pressure plate must be easy to move and slide along the carrying bar in order to gain access to the plate pack. The most common solution is a roller on top of the carrying bar, making it easy and less time consuming to conduct service. The roller should be made out of metal to be able to carry the weight of the pressure plate. The mechanical solution of the roller can be more or less robust. The risk is a pressure plate that is jammed and impossible to move when it is time to conduct service. A device between the tightening bolt head and the frame that reduces friction forces and makes service easier. Opening and closing the PHE without bearing boxes is time consuming and increases the risk of paint damage, which can lead to corrosion damage. Keeps the plates aligned during closing of the plate heat exchanger that facilitates service. Many alignment systems do not close the vertical gap between the carrying bar and the plate, leading to wavy plate packs with leaking problems.